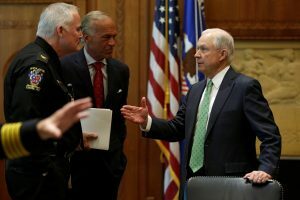 ST. LOUIS – Ferguson, Missouri, has become “an emblem of the tense relationship” between law enforcement and those it serves, especially minority communities, Attorney General Jeff Sessions said Friday during a visit to St. Louis. Civil rights investigations of police were common during the Obama administration. Sessions has suggested that civil rights investigations hinder police, causing them to back off out of fear of scrutiny of their every move. Left: U.S. Attorney General Jeff Sessions (R) talks to Montgomery County Police Chief Thomas Manger after his meeting Mar. 16 with the Major Cities Chiefs of Police Association at the Justice Department in Washington, D.C. Sessions told law enforcement leaders gathered Friday near Ferguson that the Justice Department will work with them to battle the rising tide of violent crime in America. Photo by REUTERS/Yuri Gripas.